Volkswagen has gone back for another look at one of its future cars. At Geneva's Motor Show next month, the automaker will debut its latest concept electric that takes its cues from the dune buggies that were popular in the 1960s and 1970s. Even though the sun is setting on the Volkswagen Beetle this year, it is also rising on a couple of models that do deserve revival, the VW Microbus, and Dune Buggies. The Microbus, for those who may have missed the era, is one of the icons of the “hippie days.” Those days were the 1960s when the Microbus became one of the symbols of that generation. Whether it was a concert or a “happening” like Woodstock, the Microbus was there. It presaged the minivan boom of the 1980s as the “hippies” grew up and had kids of their own. Dune Buggies were another significant movement of the 1960s. More than one car builder took advantage of the VW Beetle’s fairly open architecture – it was only a sedan body bolted onto the frame – and used the platform underneath for building lightweight runabouts that rolled into history atop the dunes of California’s coast and deserts and into the beaches of the East Coast. Early Dune Buggies used the tubular platform for creating the lightweight buggies that darted around beaches and dunes and were almost indestructible. Later on, the automaker picked up the Dune Buggy business. VW added open bolt-on bodies with convertible tops in the 1970s to make small VW runabouts. When that business petered out in the late 1970s and early 1980s, VW went in other directions, and nothing was heard of Microbuses or Dune Buggies until VW started teasing about its upcoming electric vehicle family, the I.D. series. And, now another legend is coming back to life, the Dune Buggy. 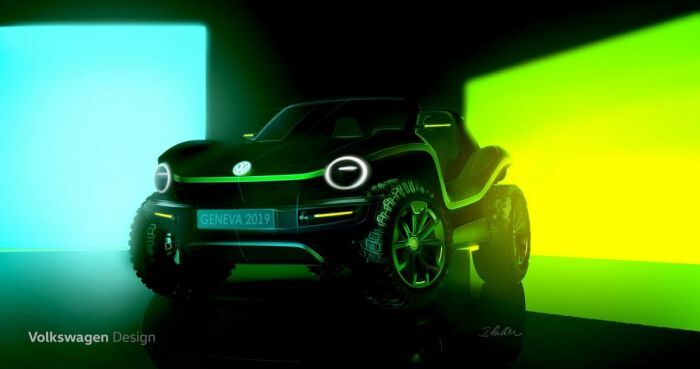 And, with that cue, VW has announced that at the beginning of March that it will reveal the first electric version of a new Dune Buggy. Like all of its upcoming electric fleet, the Dune Buggy will be based on VW’s modular electric (MEB) platform. The automaker believes the Dune Buggy revival shows just how flexible the MEB platform is. The modern interpretation looks to the past for new inspiration; vehicles that created in 1960s California. At that time, the Beetle chassis was the basis of buggies of that era. The VW chassis was just that flexible. Today, the MEB platform is also proving to be just as flexible. Like the original concepts, MEB-based electric dune buggies have no fixed roofs or doors. Large wheels and off-road tires plus open side sills dominate the overall look. It shows, the company says in a release, that the MEB concept illustrates that this “fully electric platform can be used for more than just large-scale series production models. Like the Beetle chassis of yesteryear, the MEB has the potential to facilitate the development of low-volume niche vehicles. The debut of the one-of-a-kind concept model will be at March’s 89th International Geneva Motor Show. The fully electric concept Dune Buggy will debut on March 5. The history of recreational vehicles and Volkswagen technology is a long one. From the Beetle convertible and unique bodies produced by companies such as Hebmüller and Rometsch to Dune Buggies like the Meyers Manx, the Beetle chassis allowed for creating custom solutions for decades. Globally, around 250,000 individual vehicles were built as one-offs or at low volumes through to the 1980s.